This study aims to discuss a number of terms dealing with ibadat, ‘religious observances’ in Islam as represented in the Five Pillars of Islam, and other related deeds, from a translational perspective. The study will also include some terms denoting the times, places and persons required to perform these deeds and rituals. These terms have not previously been discussed and analysed for their own specific purposes. Rather, they have been discussed in the context of translations of either the Qur’an or Hadith and thus have not given rise to much interest or explanation. 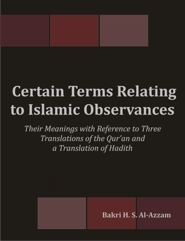 The study is restricted to certain lexical items relating to these religious obeisances with particular focus on some terms related to the Five Pillars of Islam for the following reasons: first, the total number of terms denoting these deeds is too large to be covered in a study of this type; second, the lexical items chosen for the study represent different types of problems covering various problematic areas which consequently require resort to different translational procedures; third, these terms require translators to have good knowledge of both the source and the target cultures with a deep understanding of language and religion. As these Pillars constitute the core of Islam, it is expected that readers of this work will have some knowledge about them. In addition, there are certain linguistic and cultural features found in the terms related to these Pillars, which manifest the difficulties that translators may encounter when they attempt to convey their meanings in the target language. The study will investigate ecological and environmental influences in forming the terms describing these ibadat and how these features play a major role in hindering translators from achieving the appropriate rendition of these terms in a target language where these features are not found. Based on this, the study will demonstrate that the meaning of ibadat terms is clearly linked to the time and place of their creation, a fact which should not be ignored in translation. More importantly, some features of ibadat acts are common to all the divine religions. Readers of this work will appreciate the close relationship and realise that differences are mainly confined to the way of practising the deed rather than the deed itself. Another major issue related to the terms chosen for the study concerns differences in the ways of thinking and feeling of the earliest Muslims who were first involved in practising the deeds and those of the current time who do not have the same living and thinking conditions. This difference gives rise to a change in understanding the deeds denotatively, connotatively and emotively, and in a change in readiness to do the deeds themselves. The problem becomes more complicated when the terms are translated between cultures that have clear spatio-temporal differences like Classical Arabic and modern English-speaking cultures.